Review of Nichola Dobson. Norman McLaren: Between the Frames, New York/London: Bloomsbury, 2018. McLaren’s film Neighbours (1952) changed the trajectory of my life. As a trainee art teacher on viewing the film with a group of schoolchildren (who were initially spellbound, and then could talk of nothing else until they had determined to make their own animated film – which we did), I realized the power of the animation medium, and of McLaren in particular, and decided I would use both in my teaching from then on. Since that first encounter with McLaren’s work, it has been a touchstone for me, and his astonishing variety, inventiveness, and skill are what I refer to, and refer my students to, time and again. In short, he is one of my heroes. In Norman McLaren: On the Creative Process, Donald McWilliams (1990: 10) writes: “[…] neither McLaren nor myself wished Creative Process to be a conventional, chronological biography. 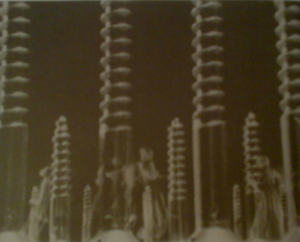 In a certain sense, we believed the man to be less important than the ideas.” He goes on to note: “McLaren reminded us that viewers bring their own knowledge, experiences and interpretation to the viewing of a film; and, therefore, have trains of thought and reach conclusions which we filmmakers cannot forecast or control” (McWilliams 1990: 11). The resonances that we take from his work are our own. In McLaren’s case his sensitivity, his surrealism, his humour, his political passion, and his sexuality are all there in the work. We have McLaren’s own words in Creative Process. What more do we need to know? Working on the adage ‘never try to “meet” your heroes, lest they have feet of clay’, I was slightly apprehensive at the thought of encountering ‘a greater story’ (Dobson 2018: 3) in a book ‘more interested in his life than his work’ (ibid. : 4). 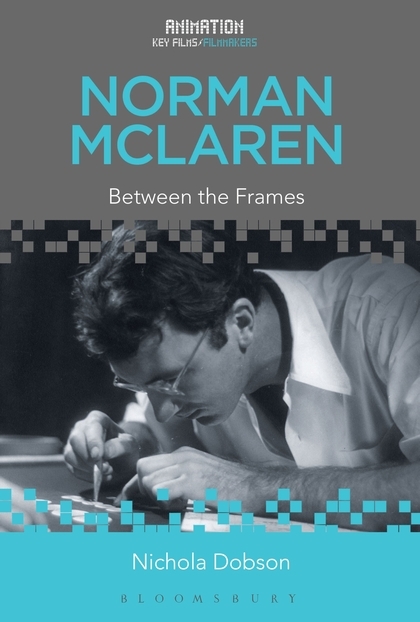 Norman McLaren: Between the Frames by Nichola Dobson is a narrative constructed with the help of McLaren’s own words from the copious correspondence he left, and which is now in the University of Stirling Archive. The ‘sheer volume of material available’ (2018: 2) to Dobson has been edited and focused on McLaren’s life, albeit the contexts for his life and work are almost inseparable, given the workaholic nature of the man. Dobson avoids ‘some salacious “outing” or gossipy confessional’ (2018: 8) tone to the book, instead outlining the facts of McLaren’s life in a down-to-earth sparse prose. Dobson’s writing style fits well with McLaren’s letter-excerpts which are written in a clipped, often quite formal and polite manner. In later life, his letters appear more relaxed, the language more expansive, possibly due to years of employment stability, loving support from Guy Glover, and an increased confidence from the recognition he received. Dobson (2018: 3) defers to both Donald McWilliams’ 1990 Creative Process and Terence Dobson’s 2006 book The Film Work of Norman McLaren as key texts for McLaren’s artistic practice. Dobson (2018:37) acknowledges that Thomas Waugh’s The Romance of Transgression in Canada (2006) provides a useful insight into the context of McLaren’s life and work in Canada during an era when his sexuality was still criminalized. However, Dobson’s book, free from coy allusions, is about the man himself. She also neatly outlines the main collaborators in McLaren’s life and work, most notably John Grierson, the larger-than-life founder of the National Film Board of Canada among others, as well as McLaren’s mentor and boss. Dobson gives double the page-space to John Grierson, compared to Guy Glover, who was McLaren’s lifelong love and support. This is understandable given Grierson’s and McLaren’s long working (and ultimately friendly) relationship, their shared origins in Stirling, Scotland, and the sheer chance or good fortune that put these two men in the right place at the right time, thus enabling McLaren to make his films and leave his mark on animation history. A still from Camera Makes Whoopee (1934), a film that Grierson slated for its sexual innuendo, but which intrigued him sufficiently to offer McLaren a job. The chapters on ‘World Traveller’ and ‘Influential Arts’ bring fresh insights to the man-as-artist, and the information in ‘Personal Life’, ‘Stirling’s Sons’, and ‘Collaborations’ are of interest in the wider contexts of animation and film history, and of The National Film Board of Canada in particular. This book confirms the impression of McLaren as a diffident, polite, quiet and private man of creative and personal integrity, with a mischievous sense of humour sometimes overlying a certain sadness or even anger. Dobson in the final chapter, ‘A Complicated Man’, alludes to these underlying emotions as coming from ‘a deep awareness of the suffering of others, sometimes suffering himself’ (2018: 159), and no doubt part of that was due to the enforced (pre-Stonewall) ‘closeted’ life with his partner Guy for nearly two-thirds of their fifty-year relationship. McLaren’s work will always be an inspirational ‘jumping-off’ point for animators, and animation educators (and our students), an example of passion and integrity to build from, mindful of his example of embodied and economical filmmaking processes, (perhaps as or more important to animators in this age of complex technological mediation). The work has always spoken for itself, and for its creator. Contrary to my fears, Dobson’s book in no way diminishes the artist, rather it gives us a more rounded version of the person who made the art. Dobson, N. (2018) Norman McLaren Between the Frames. New York/London: Bloomsbury. Dobson, T. (2006) The Film work of Norman McLaren. Eastleigh: John Libbey Publishing. McWilliams, D. (ed.) (1991) Norman McLaren on the Creative Process. Montreal: National Film Board of Canada. Waugh, T. (2006) The Romance of Transgression in Canada. Montreal/Kingston: McGill-Queen’s University Press. Leonie Sharrock is a 0.5 Senior Lecturer in Animation at The University of South Wales, Cardiff. Formerly she was a Senior Lecturer and Programme Leader (2013 – 2016) of the Newport Animation Course, part of the Newport Film School which was coincidentally set up by John Grierson in 1966. Her PhD study focuses on the relationship between tactile processes and animated narratives.